You can find other articles on the interwebs about NSExpression and NSExpressionDescription, however, I wasn’t really satisfied with the explanations I’ve seen. I decided to write a post myself after I recently had to become much more intimate with the way Core Data aggregate fetches work. I hope this will make clear what has to be done in order to harness this powerful feature of Core Data. You’ve heard it said before and sometimes in a scolding tone, “CORE DATA IS NOT A DATABASE. IT’S AN OBJECT GRAPH!”. What normally follows is a discussion about what that means, if you’re lucky. Otherwise, you’re just on your own to go figure it out. In my mind, though, it’s not necessarily wrong to think of it as a database as they have enough things in common to make it a reasonable thing to do and at the end of the day Core Data is backed by a SQLite database. I think that if it helps you understand what is going on behind the scenes better, then go for it. You do have to remember some key differences that can bite you like the need to fetch before updating or deleting, for example. Though with recent additions–last year with iOS 8’s NSBatchUpdateRequest (link to iOS 8 API diff since it’s not currently documented) which allows you to perform a batch update similar to a SQL update query or this year with iOS 9’s NSBatchDeleteRequest (See WWDC 2015 session 220 for more info) which allows for batch deletes based on whatever predicate you give it, the lines seem to be blurring more and more. tl;dr; Get the source code here: Core Data and Aggregate Fetches Code on Github. The project and source were created with Xcode 7 beta and Swift 2.0 but they’ve now been updated to Xcode 8 and Swift 3. So the question is, how do we translate this query into a Core Data fetch? The concept behind the SQL query is simple and easy to understand, but until you see how each component part of the query translates to a Core Data NSExpression or NSExpressionDescription it can be a little confusing getting the results you want in Core Data. Here are a few basic points that will clarify things a little as we head into writing our Core Data query code. When you fetch the records, you are going to be requesting that Core Data returns you an array of dictionaries. This makes sense if you think about it. You won’t get back a list of managed objects because the data doesn’t represent a single record and therefore entity. Instead, it represents rows in your data model that have been manipulated to provide an aggregate dataset–a sum of all rows grouped by product line in our case. Just as in the SQL query, you need a name for your aggregate “column”. When you run the query directly in SQLite, you don’t have to use the “as” keyword and provide a label–it will provide one for you. However, in your Core Data Query, you’re going to need to name your aggregate column. Just as in the SQL query, you need to list the columns you want to group by. 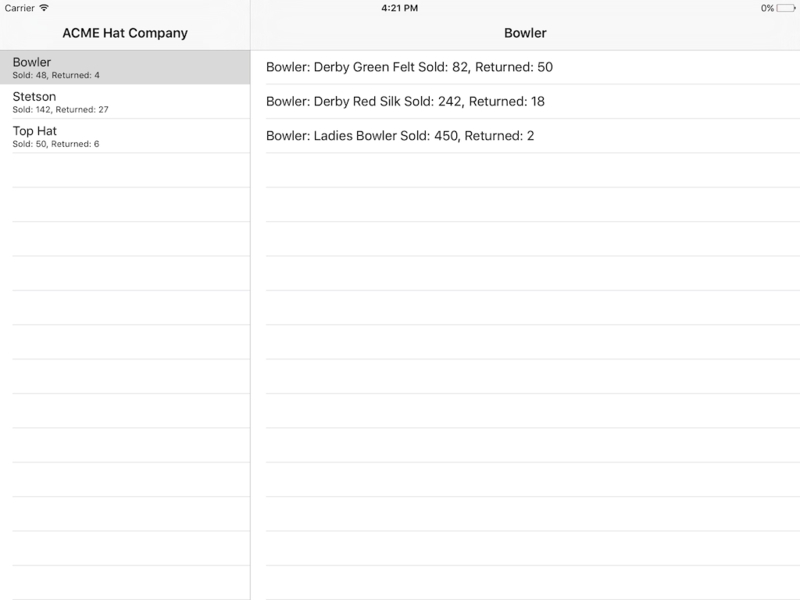 This will be the same column names you listed in your select minus the aggregate columns. We have three items we want returned. 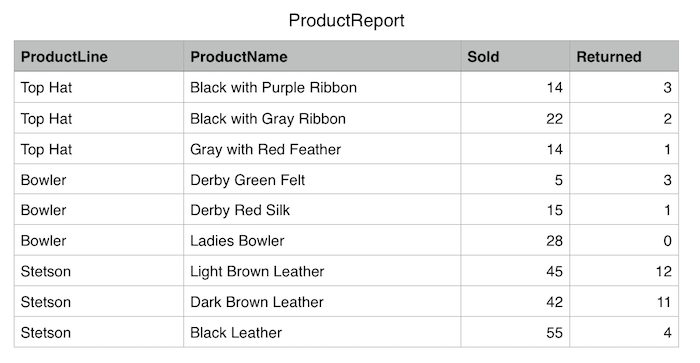 “ProductLine” is an actual column in our table–for that we should use a String, while SoldCount and ReturnedCount are new columns we are creating for our query result. They need to be added as NSExpressionDescription objects. NOTE: The data we’ve been using in the discussion up until now is contrived other than having been placed into a Numbers spreadsheet and, from there (as CSV), imported into a SQLite database just to run the command line queries–the results of which you’ve seen above. Here, however, we depart from that data and will reference similar fields, but ones that we are actually using in the demo project. The differences are subtle, “ProductLine” vs “productLine”, etc. however, it seems important to mention since the following will seem inconsistent unless we explain. Carry on. @available(iOS 3.0, *) open var propertiesToFetch: [Any]? So when your fetch request is ready to execute, you just give it an array containing Strings and NSExpressionDescriptions. Here is how I begin my code to build up these expressions. All that’s left now is to build up our fetch request. When we create our fetch request the two fields that are most pertinent are the propertiesToGroupBy, and propertiesToFetch. In the propertiesToGroupBy we provide an array containing just the one field, “productLine”. In the propertiesToFetch we specify our AnyObject array that contains Strings and NSExpressionDescription objects. Here is the code to build up the fetch request. // This is the column we are grouping by. Notice this is the only non aggregate column. // we are grouping by. // Our result is going to be an array of dictionaries. 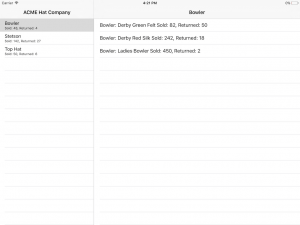 You can see that we’ve built out the detail side of the split view controller to also display a table view that contains a list of all of the products for the selected product line. Take a look at the source project on GitHub and build the source yourself to see how it all comes together. This post and the source code for it have now been updated to Swift 3 and Xcode 8. For me the impetus of mastering the aggregate fetch was poor performance doing it another way. Yes, you can achieve the results you want by performing aggregate functions on arrays of data manually, but I noticed in places where I was doing this in an app I work on the performance was growing steadily worse the more data the customer added to the table in question. Experience with RDBMSs (in some other lifetime) reminded me that performing the right query could be far more efficient and so the search was on to find an appropriate optimization. In the mean time I had resorted to doing a background fetch (on a background context) and calculation that loaded an activity spinner to let the user know that the fetch/calculation was occurring, but I hated doing that to my users–and I guarantee they hated that experience. Once I found a way to properly do an aggregate fetch (as demonstrated in this post), I didn’t even have to perform it in the background. What was taking up to 30 seconds before, was now taking milliseconds. That is a nice optimization that makes for happier users. Until next time.